All new accounts start off on a free 30 day trial, and then you can upgrade it to one of our plans (feel free to check out our pricing options here). Click on the Select button and you can finish upgrading. Or if you're currently paying monthly, click on the Switch to Yearly link to save 10% off with annual payments instead. Alternatively, if you've tried to add a third Client to your free plan (free plans include two Client spaces), you'll see an upgrade page. Again, just choose the plan you need and you're all set. The pricing includes active and archived Clients (deleted Clients do not count towards the limit). Credit card transaction fees are charged separately by the payment gateway you choose. What if I have more than 500 Clients or bill more than $150k/year? Not to worry, we have plans to support higher Client limits. Check out FreshBooks Select. Why are my credit card details not working when I try to upgrade? 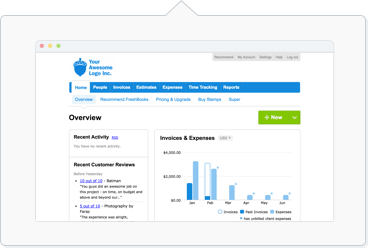 How does FreshBooks' billing work? We automatically charge your credit card information on a recurring basis. As long as your credit card information is up to date, there'll be no interruptions to your recurring payments. This billing date (determined by the date you upgrade your account) can also be confirmed by viewing the PDF receipts that are emailed to you after every monthly or annual payment.